Hello, Hello to you and this brand new year! I, Janette, am returning as a guest once again. When I saw this Altenew stamp set, Moments in Time, I was surprised to see a sentiment that summed up my feelings about 2016 so succinctly. The past year seems to have been a rough year for many, myself included. Not that the sun didn't shine on so many occasions, but a few markedly memorable events provided some choppy waters. This year, I am not waiting for any perfect moment. I will be taking moments, and making them perfect. I challenge you to do the same. Would you be surprised if I told you the background of this card was done with Copic Refills? Yep, it was - that and isopropyl alcohol! I simply dropped drips of color, straight from the Various Ink Refill, onto an A2 sized Neenah Classic Crest Solar White 80# panel. I started with B000, then B0000 and finally alcohol. Be sure to allow the drops to expand and dry before adding more that will touch the wet areas so that the watermark effect will develop. After creating the background I stamped the image in Memento Tuxedo Black and colored the image with Copics in RV14, G94, E23 and E25. Each of those colors are easily dark enough to cover to blue hue with no worries. The white Signo dots added a perfect touch of pop. 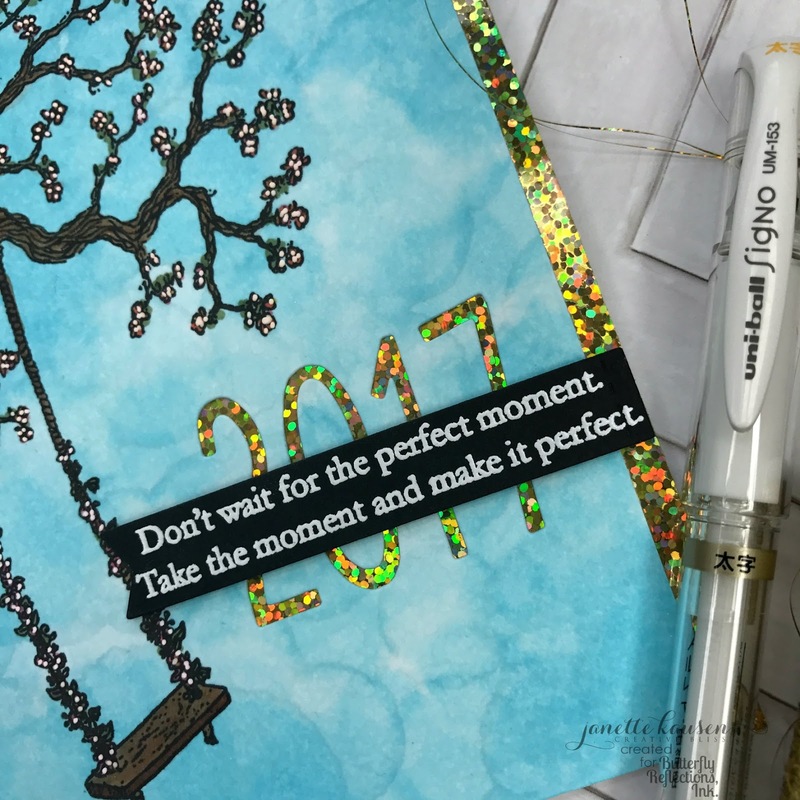 For the finishing touches, I covered the front of the card base in a holographic foil and then I used Neat & Tangled Journaling Numbers to die cut "2017" from the main panel. 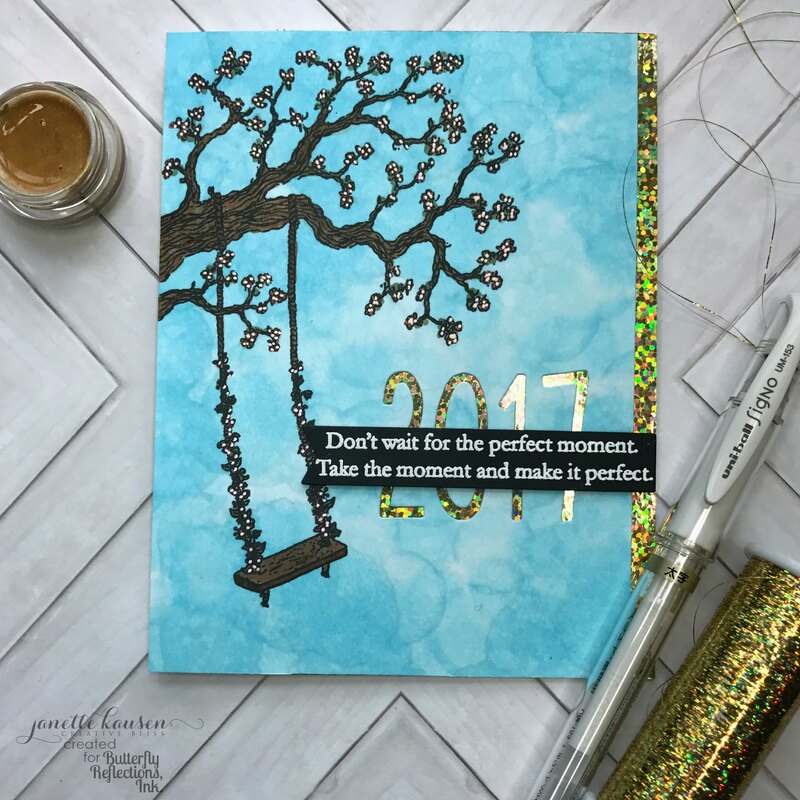 Pop the sentiment with foam tape after using Versamark, white embossing powder and the MFT Sentiment Strips to create a banner. Thank you so much for visiting today. This is your year. This is my year. Let's do this!